Remember the old saying “An apple a day keeps the doctor away?” I believed it when I was younger, and I still believe it today. This prized fruit can take on many forms – the main ingredient in your favorite pie, the perfect gift for your child’s teacher, or the all-star snack in a classic brown bag lunch. 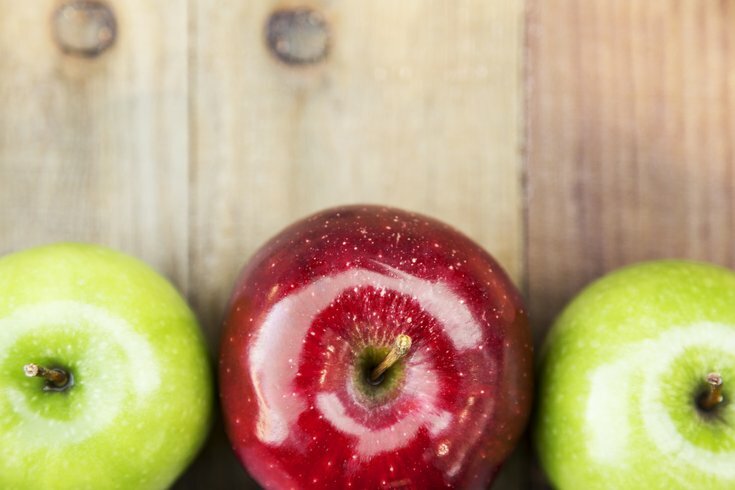 Apples come in all shades of red and green, with plenty of hues in between. When it comes to green, Crispins and Golden Delicious have a sweet flavor. Granny Smith packs a tart punch, and Ginger Golds have a killer combo of sweet and tart. But we can’t overlook the abundance of red varieties out there: Red Delicious, Fuji, McIntosh, Pink Lady, Jazz, Gala, Empire, Jonagold, Honeycrisp, Braeburn, and the list goes on. Red apples run the gamut of sweet and tart, and for this reason, I’m declaring them the winner. There’s nothing like crunching into an apple. It’s crisp and refreshing, cleanses your palate after meals, and helps clean your teeth. And there’s no contest when it comes to convenience, all you need to do is give an apple a quick wash and it’s ready to go. But…let’s be honest: raw apples are no match for the endless ways you can bake with an apple, not to mention, the intoxicating smells of cinnamon, nutmeg, and cloves that fill your home (even better than the scented brooms sold outside of every grocery store in the fall). Think about how versatile apples are — apple pie, Jewish apple cake, apple cobbler, apple cider, apple cider donuts, applesauce, apple butter. And don’t get me started on how perfectly they complement any savory meal. Baking with apples doesn’t have to mean loads of calories (although it can), here are a handful of healthy apple recipes for you to try. Don’t make me pick a winner. Raw apples win for simplicity and nutrition, and baked apples win for variety and overall deliciousness. To peel or not to peel, that is the question. And the answer is simple: keep the peel on! If you’re like my kids, you’ll ask for your apples peeled and sliced thin. But if, unlike my kids, you care about nutrition, you’ll keep that peel on. Apple skin contains the most fiber, vitamins (vitamins C and A), and antioxidants. These antioxidants have been shown to improve lungs and memory loss, and even fight cancer cells. And if you’re worried about adding extra sugar to your diet with apples, don’t be. Apples contain soluble fiber, so your body doesn’t turn it into glucose. In fact, eating an apple slows down how quickly your body absorbs sugar. We all do it. We know organic is better but we opt for conventional produce because it’s easier on the wallet or more readily available. Is there more to losing weight than just diet and exercise? There’s also a list called the Clean Fifteen that ranks the produce with least amounts of pesticide. It’s important to note, that the Environmental Working Group always recommends eating fruits and vegetables, even conventionally grown, instead of processed foods and other less healthy alternatives because the benefits far outweigh the risks. So how ‘bout them apples? Feel like food is a battle? Get free nutrition counseling visits! Did you know that Independence Blue Cross members get six free nutrition counseling sessions a year? * Search for a participating registered dietitian using our provider directory. Information on this site is provided for informational purposes and is not meant to substitute for the advice provided by your own physician or other medical professional. You should not use the information contained herein for diagnosing or treating a health problem or disease or prescribing any medication. If you have, or suspect that you have, a medical problem, promptly contact your health care provider.